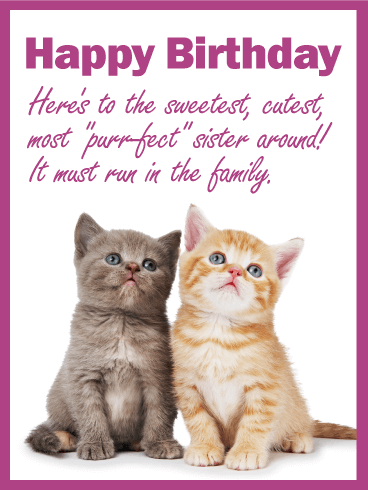 If you and your sister are two peas in a pod, this is the birthday card you've been searching for! These precious kittens are obviously best friends, just like you and your sis. It's a can't miss birthday card, for sure. Bonus: Calling her your favorite sister is sure to earn you some brownie points! 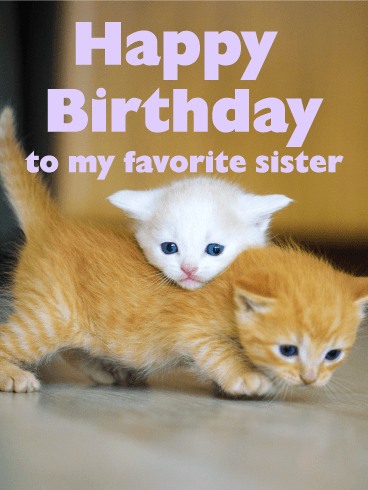 These little kitties want to help you wish "the most 'purr-fect' sister around" a very happy birthday...and to remind her that "it must run in the family!" 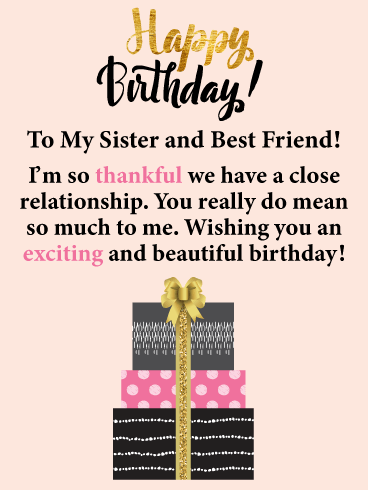 A mix of funny and sentimental is what makes this birthday card a wonderful choice for the kind of sister who loves to joke around just as much as she loves all things cute and cuddly! The tradition of making a wish and blowing out the birthday candles gives hope to many that their wish may come true! This is what makes this happy birthday card so very special. 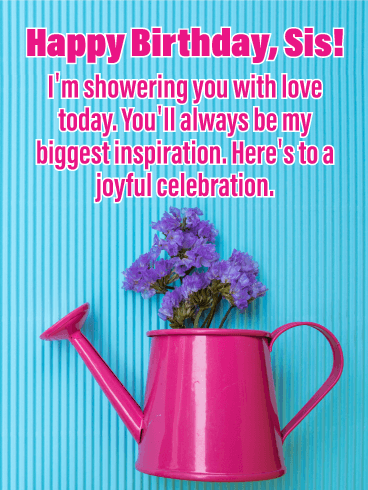 It allows you to send a little hope your sister's way on her big day! 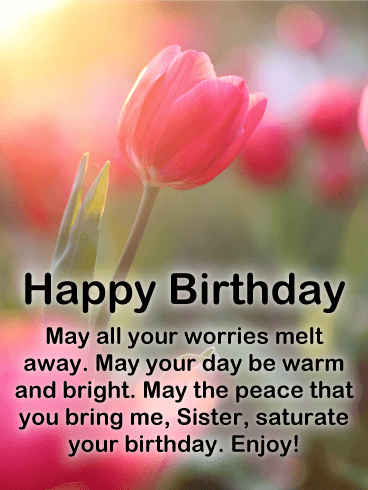 Wish your sister the best day ever by getting these great birthday candles over to her today so that she can make her special wish without delay! 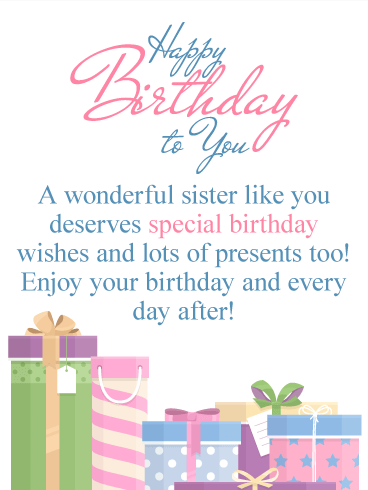 Your sister's birthday is not only a special occasion to her, but to you also! This was the day that your sister was born! 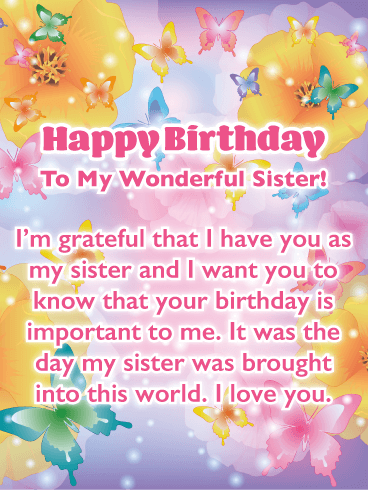 This birthday card will bring a tear of joy to your sister's eyes when she reads how you feel about her. She will really like the beautiful pastel colored butterflies. So very lovely! Send these pretty butterflies on their way to tell your sister you love her and to wish her a happy day! All those years growing up with your sister has given you many beautiful memories that you can reflect back on. 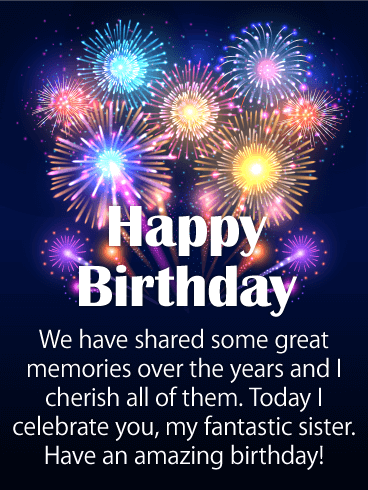 This birthday card lets your sister know how much those memories mean to you. The endearing message along with the image of two sisters that represents how close the two of you are will bring a smile to her face. 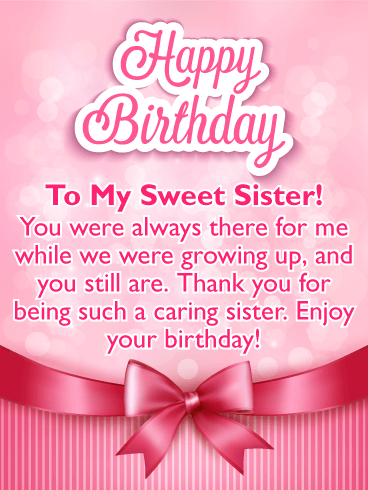 Send this special birthday card to your sister to let her know much you care about her! Decorative birthday presents and a special golden bow will remind your sister that her special day has arrived! 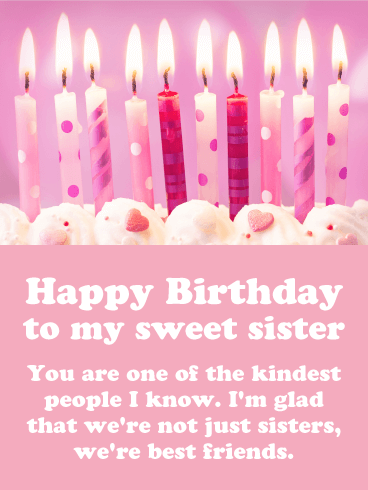 This pretty birthday card also lets your sister know how thankful you are for your close relationship with her. This will surely make her birthday a little brighter! Now that the presents are wrapped so perfectly, send them to your sister for her big day! A beautiful yellow cake with cheerful daisies and white candles burning brightly on top is surrounded by lots of gifts, setting the scene for a special celebration. 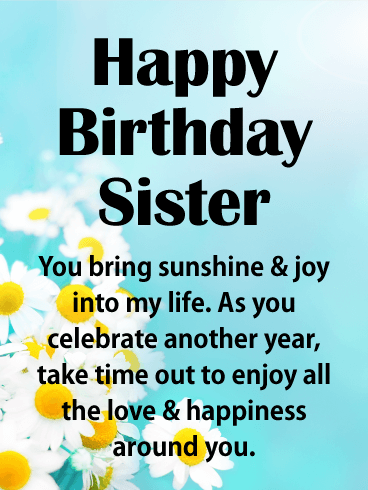 What better way to wish your sister a very happy birthday! 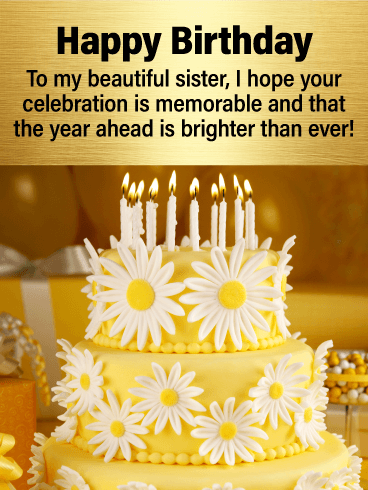 With a simple yet sentimental message above against a golden background, this fanciful and festive birthday card is sure to make her feel loved, remembered and ready to jump right into another amazing year ahead. A perfect pink frosted cupcake and a sparkling background are just what you need to add some excitement to your sister's big day! 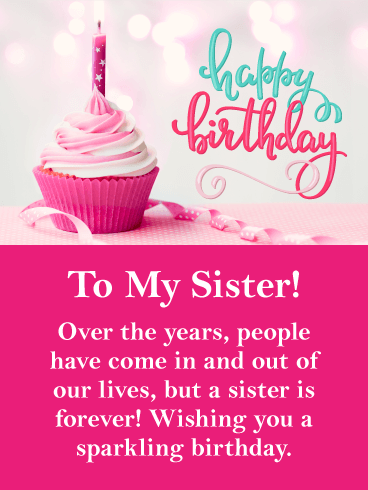 This great birthday card lets your sister know that although people come and go, a sister is forever. Such a sweet thing to say! Your sister will certainly appreciate your thoughtful words. Be sure to send this irresistible cupcake over to your sister for her birthday! 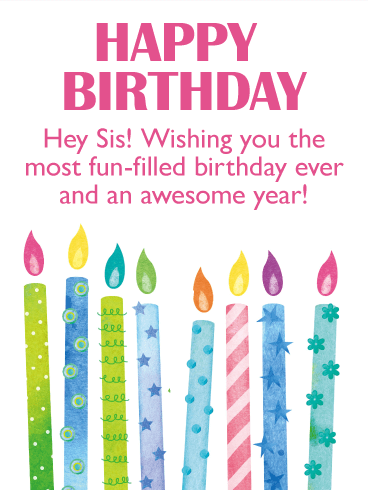 Wish your sister a fun-filled birthday and an awesome year with this bright and colorful happy birthday card! It's bursting with excitement and will get your sister's birthday off to a great start. This birthday card features pretty decorative pastel colored candles as well as birthday confetti! 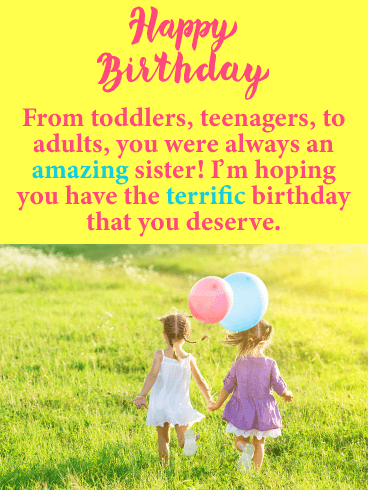 Your sister's birthday only arrives once a year so make sure to send her this birthday card that represents just how fun a birthday can really be! 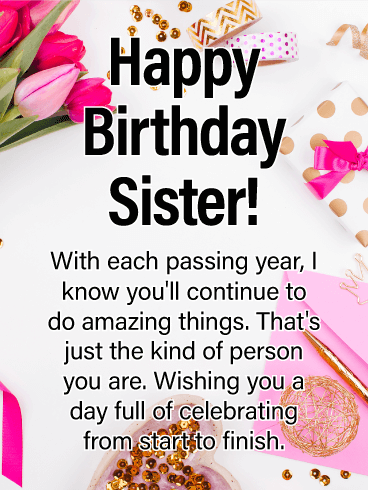 Sisters can be so caring and thoughtful, and if this sounds like your sister, then let her know how much it means to you with this sweet sister birthday card! 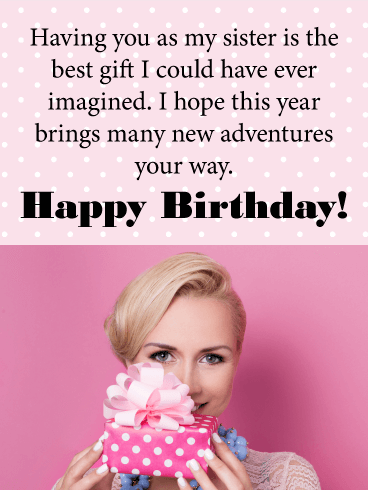 It features a beautiful sparkling pink background, a pretty pink birthday bow, and fancy happy birthday letting. 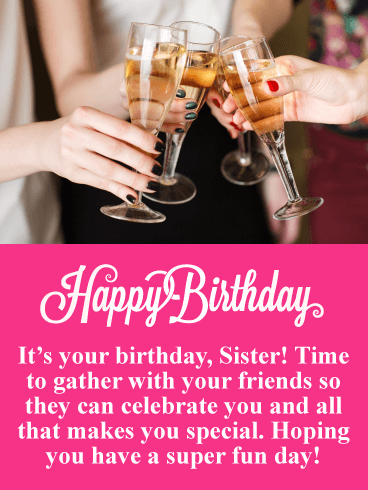 All these elements together create a birthday card that your sister will adore! 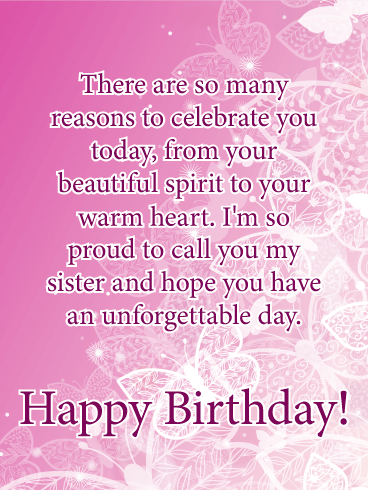 Send this pretty birthday card to your sister so she can start her special day with a smile! 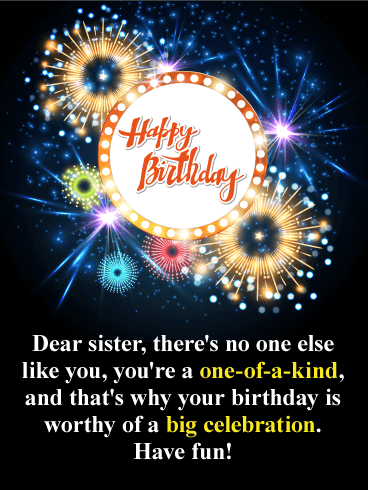 Sparkling golden stars along with exceptional shapes and colors frame this birthday message that was written just for your sister! 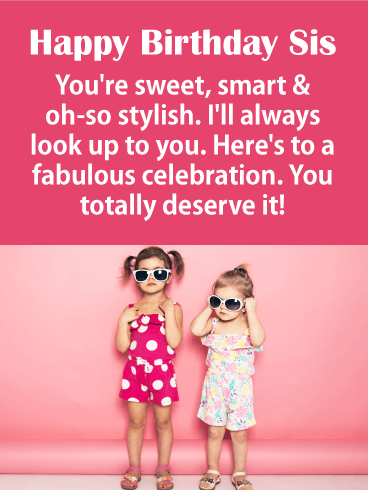 Imagine her surprise when she sees that this birthday card says that you think she is fabulous! It will make her day! 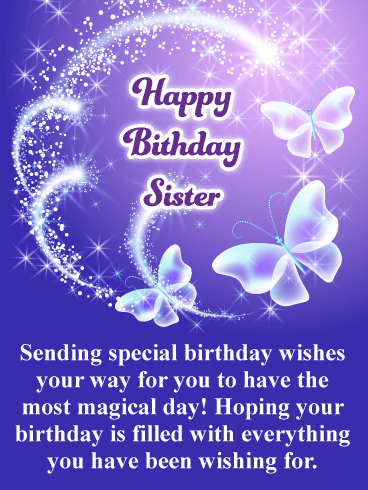 Sisters are very special and deserve the best so you can't go wrong in sending this spectacular birthday card her way. 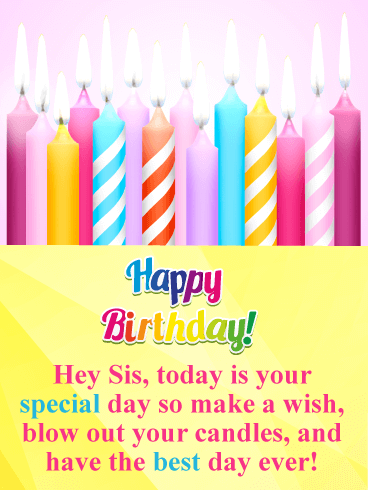 Don't delay, make your sister feel special today! Nothing says an important occasion is taking place more than sparkling fireworks bursting in the air! That's what makes this birthday card so very special. The colorful fireworks look great against the black sky and will add some excitement to your sister's day. 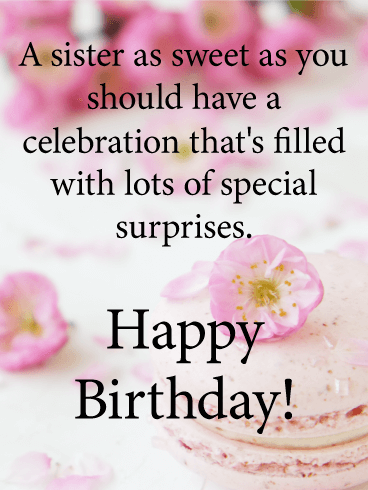 It will remind your sister that her birthday is worthy of a big celebration! Light the fireworks and send them on their way to make sure your sister has a fabulous day! Everyone gets excited about the birthday presents they will receive on their special day, and this happy birthday card is all about the presents! It contains beautifully wrapped gifts that anyone would love to open on their birthday! Don't delay, send these pretty presents your sister's way so she can unwrap them on her birthday and have a wonderful day! 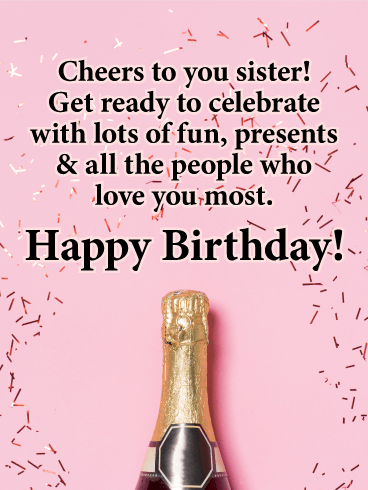 When you see champagne and fireworks, you know there is something special going on, and that would be your sister's birthday! This celebration birthday card has excitement written all over it. In addition to this, it features a touching message that will add joy to your sister's big day. You can imagine how happy she will be when she reads that you would not change a thing about her! 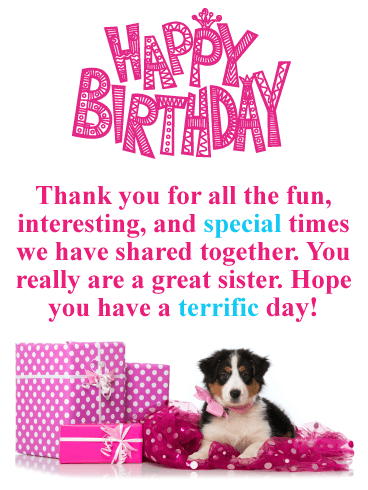 Wish her a happy birthday with this exciting greeting card today! 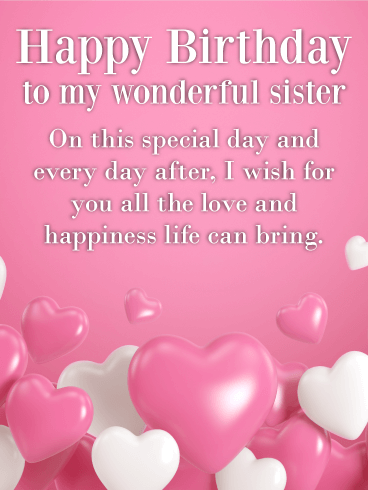 Send your sister a birthday card that will get her excited for her birthday and touch her heart. This exceptional greeting card is bursting with color and very fitting for the occasion at hand! 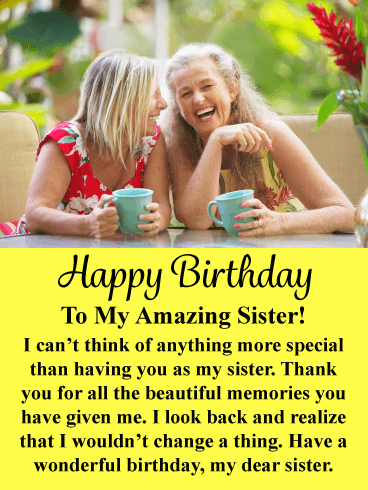 It will enable you to share with your sister how you have great memories of the two of you, along with the fact that you think she is a fantastic sister! Be sure to send these vibrantly colored fireworks to your sister in honor of her birthday! 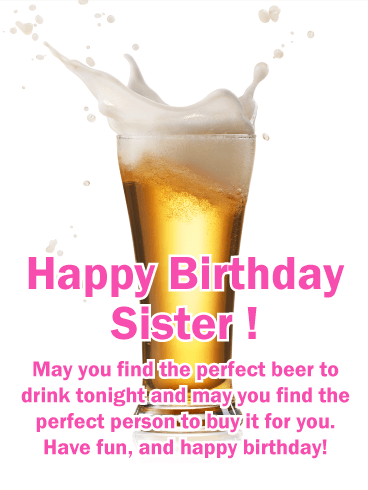 Looking for an extra special birthday card to send to your sister? Then look no further! 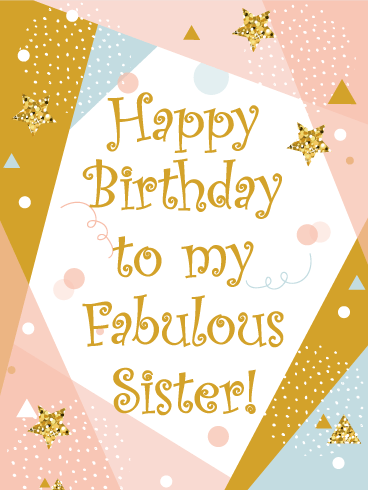 This greeting card sparkles and shines in honor of your sister's birthday. 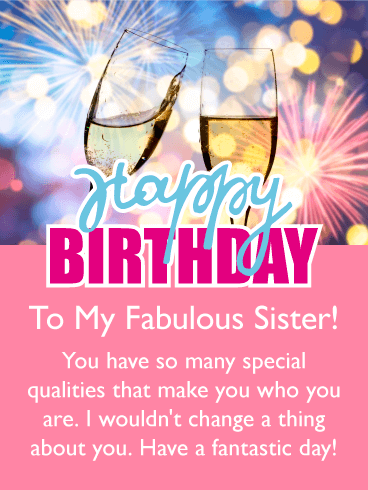 It expresses that you feel your sister is a one-of-a-kind which makes her birthday worthy of a huge celebration. She will appreciate that you took the time to choose such a great birthday card just for her! Is your sister one of those people that seems to never age and looks beautiful no matter how old she is? 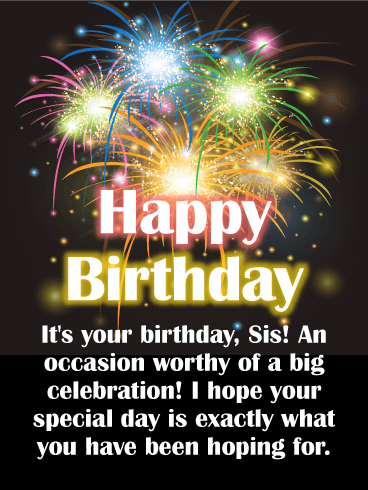 If so, then she would certainly love to be reminded of it with this fashionable happy birthday card! 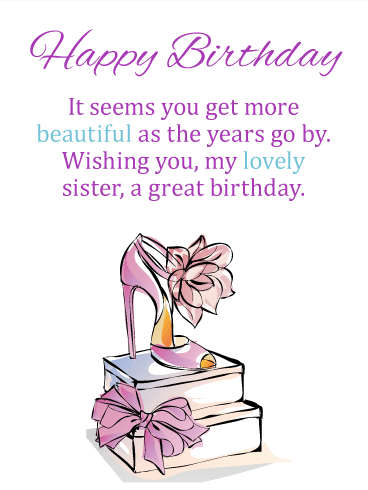 It showcases a pretty pink high heel shoe and ribbon that represents beauty as well as the fact that birthdays are an occasion to get dressed up! 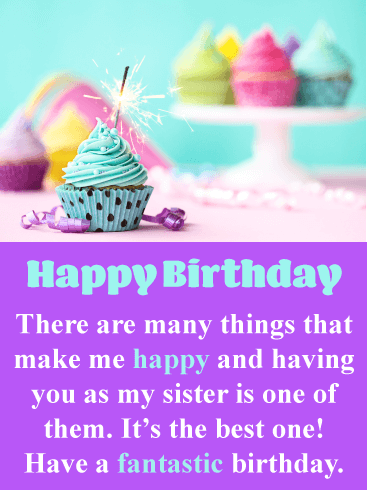 Send your sister this wonderful birthday card to wish her a great birthday! The sweetest people are those who are nothing but kind to you. And your sister has always been kind. Whether it's pretending to enjoy your burnt cookies or checking-in after a rough day, your sister has your back. 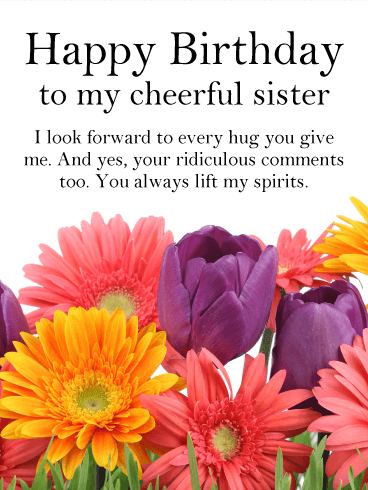 On her birthday, let your sister know how much she means to you. Wish her cake and candles, a birthday full of sweet treats. 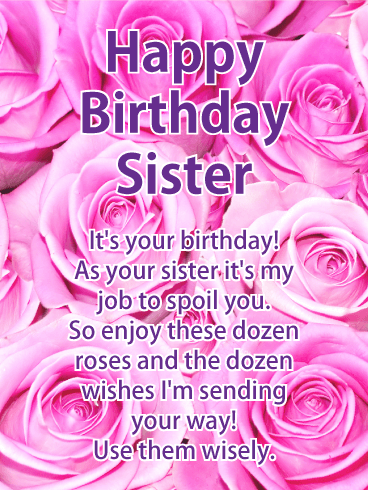 Let her know that you could not have asked for a better sister or a better friend. 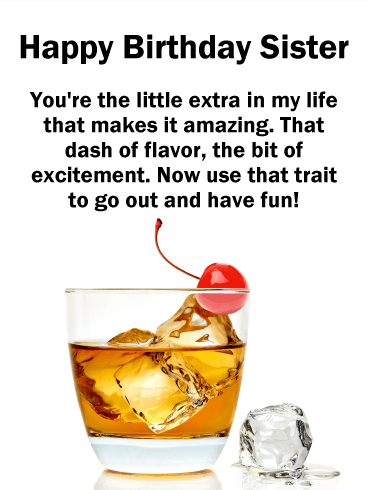 Tell her you care with this birthday card. There's no doubt about it. Your sister is a 'fun person'. She knows the best people, the best places, and can always show you a good time. Every single one of those times is amazing not because of her knowledge, but because you're having them together. 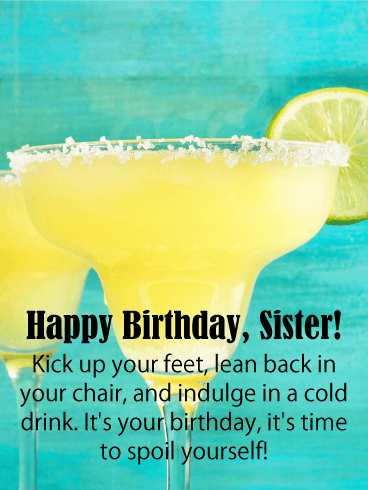 So reach through space and give your sister a birthday drink. Wish her health, wish her love, and wish for a swift, fast reunion. 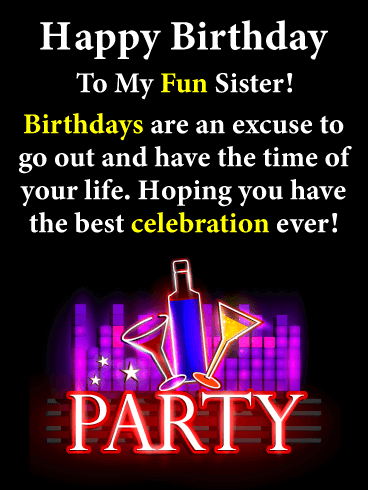 Wish her a fun, crazy birthday, and then wait by the phone for the details the next morning. It's the people we know who make life exciting, and boy does your sister make life exciting. She has the special talent of taking something ordinary and boring and turning it into an amazing experience. 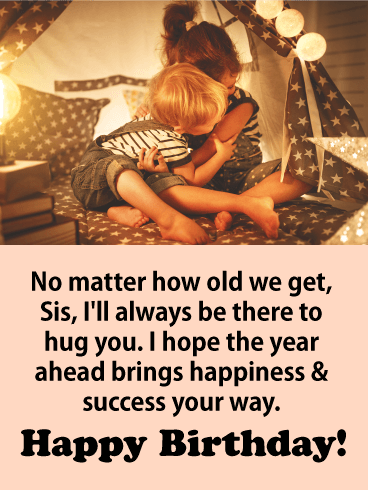 This year, do the same for your sister! Wish her a bit of pizazz to spice up her birthday. Let her know that after all the adventures she's led you on, it's now your turn to nudge her fun. After all, what better day to party than a birthday? Your sister has always been a beach girl. Wigging her toes in her sand, diving into swells, and lounging on towels with a book. Lazy days, sunny days. They're your sister's dream vacation. For your sister’s birthday, send her right back to her favorite beach bar. Make her remember the salt spray, the crashing waves. Gift her a birthday in her favorite place and wish her the peace of mind a beach has always given her.